The 1st and the last stitches of the pattern are selvedge stitches. 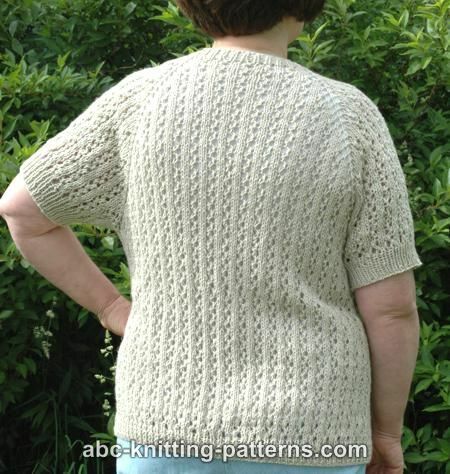 In this pattern I slip the first stitch as if to knit and purl the last stitch. Raglan increase is worked as follows: work to marker, yo, sm, k1 (raglan st), yo. Please note, that raglan sts are marked in orange in Back and Left and Front charts. 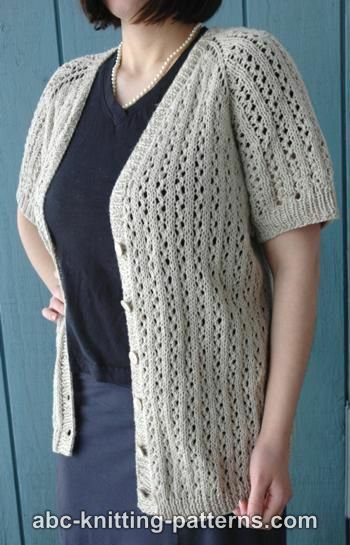 The cardigan is worked from top to bottom, back and forth without seams. 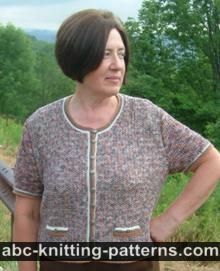 The sleeves are worked in rounds without seams. Provisional cast on 50 [50, 54, 54, 54, 58] sts. Set-up row (WS): k1, p1 (right front), p1 (raglan st), pm, p10 (right sleeve), p1 (raglan st), pm, p22 [22, 26, 26, 26, 30] sts (back), p1, (raglan st), pm, p10 (left sleeve), p1 (raglan st), pm, p1 (left front), p1. 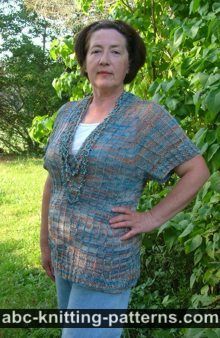 Work neckline and raglan increases a well as lace pattern from the charts. Next row (RS): work row 1 of Left Front chart to marker, yo, sm, k1 (raglan st), work row 1 of Sleeve chart to marker, yo, sm, work row 1 of Back chart, working 4-st pattern repeat 2 (2, 2, 3, 3, 3, 4) more times, work to marker, yo, sm, k1, work row 1 of Sleeve chart to marker, yo, sm, work row 1 of Right Front chart to end. Row 2 and all even rows (WS): sl1, purl to end. Continue to follow the Back Chart for 44 (50, 52, 58, 64, 66) rows. 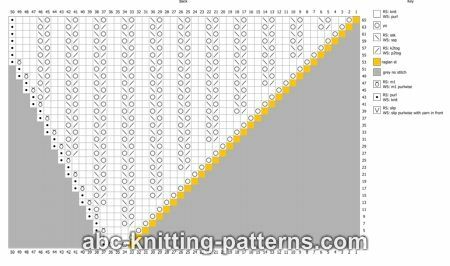 Follow the Sleeve Chart for 32 (34, 40, 46, 48, 50) rows, then continue as established, without increases. 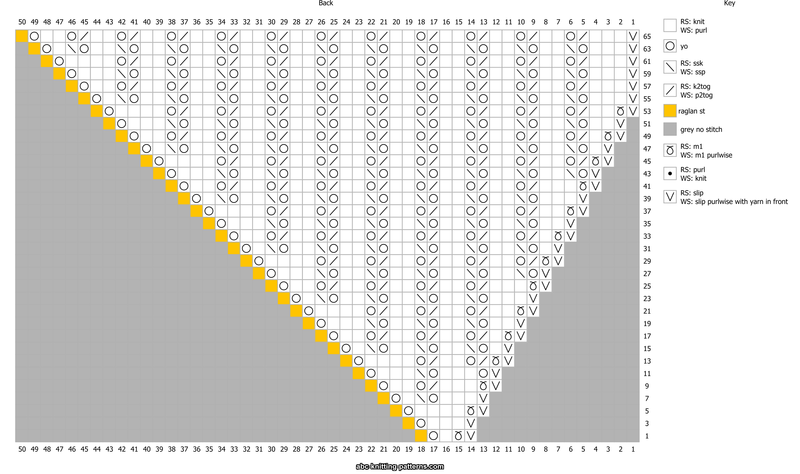 Follow the Left Front Chart and Right Front Chart for 44 (50, 52, 58, 64, 66) rows for raglan increases. AT THE SAME TIME, to shape the V-neck, work the increases at the beginning and the end of the row in every 4th row 11 (11, 13, 13, 12, 14) times. Stitch count before division for sleeves: 224 (240, 264, 288, 302, 316) sts. Row 45 (51, 53, 59, 65, 67) (RS): Work left front sts, transfer left sleeve sts to a length of yarn, cast on 6 (8, 10, 12, 15, 17) sts with single cast on, work back sts, transfer right sleeve sts to a length of yarn, cast on 6 (8, 10, 12, 15, 17) sts with single cast on and work right front stitches. Next row and all even rows purl. Work the bodice as established to desired length. Work 8-12 rows in 1x1 ribbing. Cast off. Transfer sleeve sts from the yarn to the needles and pick up 6 (8, 10, 12, 15, 17) sts over the underarm sts. Round 1: continue to work lace pattern, knit picked-up sts. Round 2 and all even rounds knit. Rounds 3, 5, 7 and 9 like round 1. To shape the sleeve decrease the picked-up sts. To shape the sleeve work k3tog at the center of the picked up sts in every 4th round. Work sleeve to desired length. Work 8 rounds of 1x1 ribbing. Cast off. Unravel the provisional cast on and transfer the sts to circular needles. Holding the working piece with the right side to you, pick up sts along the right front edge on the second pair of circular needles. Knit the next 50 [50, 54, 54, 54, 58] sts. Pick up sts along the left front edge. Work 3 rows in 1:1 ribbing. Row 4 (the edge of the right front): work 8 sts, k2 tog, yo, *work 10 sts, k2 tog, yo - rep from * 5 times for buttonholes. Rows 5-8: work 1x1 ribbing. Sew 6 buttons to the left button band. There are 49 total comments on this article. Ssk - slip, slip, knit, this is the left-leaning decrease. If the row is not mentioned, then you are not supposed to make a decrease, just knit. Yes, you can knit the sleeves to any desired length. Yes, this is for all sizes. Repeat 2 times, means total of 2 times. 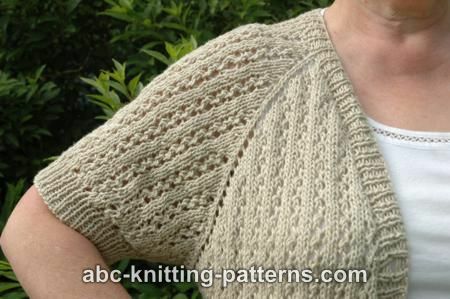 The lace pattern repeat is 4 sts. You are casting on 10 sts for each sleeve. That means that you have to work 2 pattern repeats (4+4=8) and 2 more sts. Total is 10. 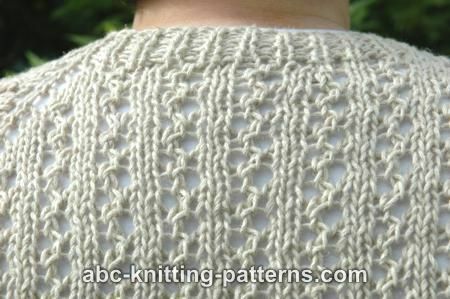 The purpose of the graph is to show how to handle the increases at the raglan lines, how to incorporate these stitches into a lace pattern. 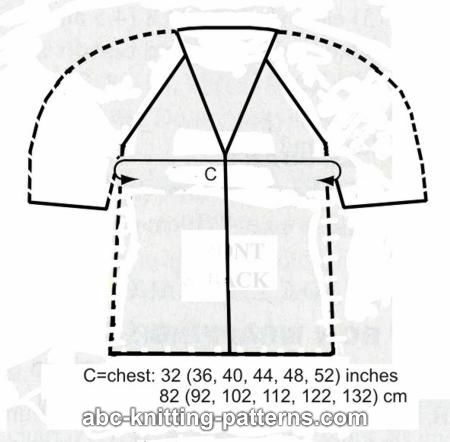 Since the increases are the same for all raglan lines, this graph can be used for sleeves as well as for back and fronts. 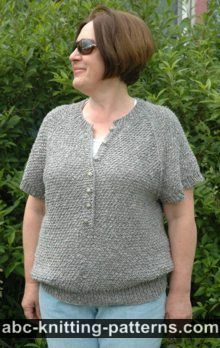 Sleeves are worked in rounds without seams, that is why the even rows are knit. See pattern notes at the beginning of the pattern. 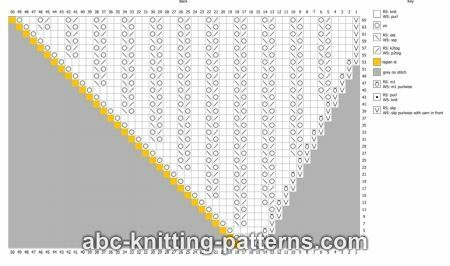 There are 2 repeats of the pattern in the rows 1, 3 and 5, please check the pattern. For the rows beyond row 7, please see the chart. The chart isn't big enough to see or read. I don't understand where to increase on the fronts. Is the chart for the back only or where? If you look through the previous twenty-odd comments, your questions will be answered.